The deadline of 31 August 2016, which was subsequently extended to 30 September 2016 for estate agents to register for their EAAB Privyseal has duly expired. It is most pleasing to report that some 65% of estate agents have already signed up and are using their Privyseal. The EAAB wishes to extend their appreciation for their prompt co-operation in this regard. For the estate agents that remain it is therefore pertinent to request that all Principal estate agents ensure that all their employees register for their Privyseals without delay. To register for your Privyseal, it is imperative that the estate agent (regardless of status) has been issued with a valid Fidelity Fund Certificate (FFC) for 2017 and that all their contact details that reside on the EAAB's database are correct. Following the EAAB's successful pilot of the PrivySeal Consumer Protection Initiative in June 2016, the EAAB now requires all registered estate agents to sign up, at no cost, for their estate agent Privyseal at www.privyseal.com. Pursuant to the article in AGENT magazine issue 123 and the subsequent e-mail communication on 22 July 2016, the EAAB is gratified to note that a significant number of estate agents have already signed up and are making use of their Privyseals. The EAAB has, however, decided to extend the time period in which estate agents may register for Privyseal to 31 August 2016, prior to advising property consumers during September 2016 to only deal with estate agents with Privyseals. 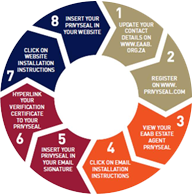 Given that the use of Privyseal is mandatory to protect consumers and ensure that estate agents are fully compliant, it is imperative that all principal estate agents ensure that all estate agents in their service sign-up for their Privyseals, and make use of them in their e-mail signature, and on the firm’s website by 31 August 2016. Principals should notify the EAAB once all their estate agents have signed up for their Privyseals by submitting a spreadsheet of names of employees and their Privyseal URL’s to info@privyseal.com so that compliant estate agency firms can be featured in various property publications, and other media which the EAAB will be doing from September onwards. Please use the infographic below to see what steps are required by your agents to get and make use of their Privyseals. You may also view the Getting Started Guide, see here. 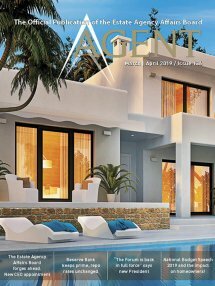 To find out more, please read the article on page 24 and 25 of the Agent, Issue 123, see here. We trust that this initiative will benefit all estate agencies, estate agents and serve to protect consumers. The Estate Agency Affairs Board (EAAB) is launching a new initiative designed to help consumers distinguish between illegal operators and legitimate estate agents. This initiative aligns with our key mandate of regulating estate agents in the interest of protecting housing consumers. The EAAB is mindful of widespread negative publicity arising from the very real risk of unregistered estate agents to members of the consuming public and other interested stakeholders. It is essential that consumers only deal with registered estate agents who can be trusted to provide expert and professional advice and, moreover, act in the best interests of those consumers. Registered estate agents must meet minimum professional standards and comply with other criteria, including participation in Continuing Professional Development programmes, to retain registration status. It is an unfortunate fact that unregistered and/or non-compliant operators within the estate agency sector pose a severe risk to both registered professionals and the wider public. Such persons generally have only a limited knowledge of property law and procedure; do not open or maintain requisite trust accounts; are not audited; and do not comply with mandatory educational requirements. The EAAB has, consequently, commenced various initiatives for the protection of registered estate agents and the public alike. In furtherance of the need to enhance the professional standing of registered estate agents, the EAAB will continue to partner with identified stakeholders to ensure that it successfully achieves its core consumer protection mandate. Many people claim to be registered estate agents but they are not. Regrettably using the services of unregistered “estate agents” is risky because they are not accountable or otherwise regulated. What does the EAAB wish to achieve? By partnering with PrivySeal the EAAB hopes to assist members of the public to distinguish between registered estate agents and illegal operators while, simultaneously, encouraging consumers to only deal with registered and professional estate agents. PrivySeal gives professional estate agents a digital seal (“Privyseal”) and hyperlinked Verification Certificate which confirms the current registration status of those estate agents in real-time. A Privyseal can only be displayed once the EAAB database has confirmed that the estate agent concerned is fully compliant, duly registered and has been issued with a valid fidelity fund certificate. All registered estate agents must access and embed their Privyseal into their email signature and digital media such as, for instance, websites and social media profiles. A Privyseal is an up-to-date seal of authenticity that is displayed in e-mails, websites and social media. The Privyseal summarises professional credentials and enables members of the public to check that the person they are dealing with is, in fact, a registered and suitably qualified estate agent. The Privyseal indicates the name of the estate agent concerned, that person’s title, the registration status of the estate agent and the date and time when the information was last verified by the EAAB. It also invites the viewer of the message to click on the Privyseal to “View Details”. When the Privyseal is clicked on a hyperlinked Verification Certificate opens on the PrivySeal website. enhances awareness of the existence of, and functions performed by, the EAAB. How does Privyseal help solve the problem? Only duly registered estate agents will have access to an EAAB Estate Agent Privyseal. The EAAB will ensure that consumers are not only made aware of this fact but also encouraged to view the estate agent’s Privyseal before dealing with any estate agent. In time, if an estate agent is unable to display their Privyseal consumers will validly become suspicious of their authenticity and, indeed, demand that the estate agent concerned obtain such a Privyseal. Will the information appearing on the Privyseal be correct? The information appearing on the Privyseal, as well as the linked Verification Certificate, is continuously checked and verified against the EAAB’s records. It is the responsibility of estate agents to ensure that their information is properly recorded with the EAAB. How can consumers check whether the Privyseal is legitimate? Clicking on the Privyseal should open a Verification Certificate on the PrivySeal website, WWW.PRIVYSEAL.COM. The Verification Certificate displays the contact and professional details of the estate agent in question. Consumers and stakeholders should check to see that they are on the PRIVYSEAL website by looking for the green “Extended Validation” bar at the top of the PrivySeal Verification Certificate which should contain the text “PrivySeal Pty Ltd (AU)”. Where will the Privyseal be displayed? Consumers will expect to see the Privyseal in the estate agent’s e-mail signature, social media and website. How can a consumer view an estate agent’s Privyseal? Any estate agent having a Privyseal can access that Privyseal online, for purposes of showing it to a consumer, through any web-browser - whether on their mobile telephone, tablet, laptop or workstation. Consumers will be encouraged by the EAAB to ask for a Privyseal when dealing with a professional estate agent. How can estate agents obtain their Privyseal? Estate agents should first check that their details are correctly recorded on the MyEAAB Portal. Using the same names, email address and mobile number as are recorded with the EAAB all estate agents should then sign-up for free on WWW PRIVYSEAL. COM. On successful sign-up the EAAB Estate Agent Privyseal will be automatically issued. The Privyseal will bear the name and qualification of estate agents as reflected in the EAAB database. It is imperative, therefore, that all estate agents ensure, as they are in any event obliged to do, that the EAAB has their correct registration and contact details for display on the Privyseal when a verification check is done. The Privyseal will also reflect the date and time when the professional qualifications were last checked and links to a Verification Certificate indicating additional information including contact details, information pertaining to the issue of fidelity fund certificates, educational status and whether the estate agent concerned is enrolled for Continuing Professional Development. A Privyseal will only display if the estate agent concerned is currently registered with the EAAB and has been issued with a valid fidelity fund certificate. The information displayed on both the Privyseal and the linked Verification Certificate is drawn from the EAAB database and will, accordingly, reflect the latest contact details that the estate agent has provided to the EAAB. Privyseal is a visual way of confirming that persons are registered estate agents who are in good standing with the EAAB. Estate agents should insert their Privyseal into all e-mail signatures and enterprise websites to distinguish the firm and persons concerned from unregistered operators. All estate agents (that is to say, principal, non-principal and intern estate agents) must ensure that they download and embed their Privyseal for use on their email and websites by 30 June 2016. Should the contact details on the Privyseal be incorrect, estate agents are requested to update them accordingly by logging onto the EAAB website www.eaab.org.za using the MyEAAB Portal. Estate agents may, alternatively, click on the left navigation menu bar on the EAAB website to update their contact details. A manual format may also be used to notify the EAAB of any change in the details originally supplied by estate agents. This will require that estate agents to download and complete the required form and dispatch the same to the EAAB in accordance with the details appearing thereon. Their Privyseal will be updated once the EAAB database is updated. A pilot project designed to test PrivySeal’s consumer protection service commenced on 1 June 2016. Privyseals will be introduced as a mandatory requirement for all estate agents from 31 July 2016. The EAAB will be launching a public awareness campaign with PrivySeal during August 2016. Estate agents must register and use their Privyseal by 31 July 2016. Detailed information regarding PrivySeal will be published in forthcoming issues of AGENT. Following the EAAB's successful pilot of the PrivySeal Consumer Protection Initiative in June 2016, the EAAB requires all registered estate agents to sign up for their Privyseal at www.privyseal.com. All registered estate agents are required to sign-up for their Estate Agent Privyseal and to insert it into their email signature and website by no later than 31 July 2016. Your Estate Agent Privyseal distinguishes you from non-compliant and unregistered estate agents and serves as an always up to date and verified business card. View the infographic below to see what steps are required to get and make use of your Privyseal. You may also view the Getting Started Guide below. To find out more, please read the article on page 24 and 25 of the Agent, Issue 123. The Estate Agency Affairs Board (EAAB) has embarked on an awareness campaign for all prospective property consumers to advise them and encourage them to only deal with estate agents whose compliant registration status is evidenced by their EAAB Privyseal.